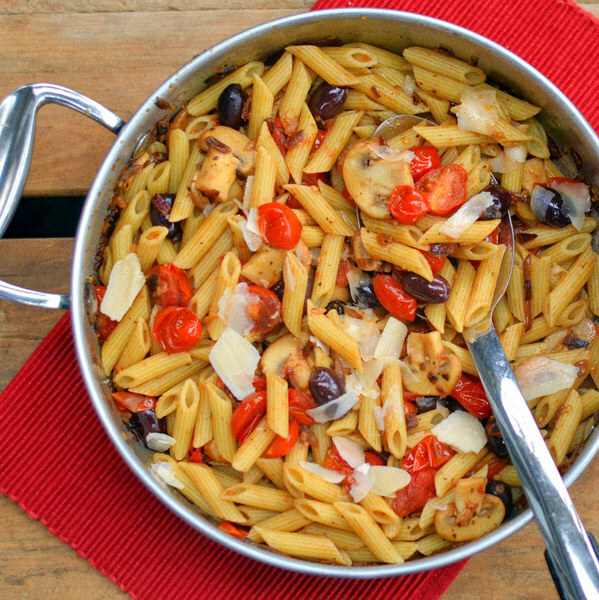 ← Tomato, Mushroom & Kalamata Olive Penne with Parmesan. Fill a large pot halfway with water, cover, and bring to a boil. Uncover, add salt and pasta, and stir for a few seconds. Cook until desired firmness, 8-10 minutes. Drain. Wash tomatoes and mushrooms. Halve the tomatoes. Thinly slice the mushrooms. Peel and mince garlic. Coat bottom of skillet with oil. Add garlic and crushed red pepper and cook until fragrant, 15-30 seconds. Add tomatoes, mushrooms, Italian seasoning, salt, and pepper. Stirring occasionally, cook until mushrooms are tender and tomatoes are juicy, 2-3 minutes. Shave or grate ¼ cup of Parmesan cheese. Add olives and pasta to pan and toss to combine. To serve, place pasta on a plate or in a bowl and garnish with Parmesan. Enjoy!